Causation is both bottom-up and top-down: material cause from the bottom, and final cause from the top, as Aristotle might say. Economics, or as I prefer, “political economy,” is in between, and serves to balance desirability (the lure of right purpose) with possibility (the constraints of finitude). We need an economics fit for purpose in a finite and entropic world. As a way to envision such an inclusive economics, consider the “ends-means pyramid” shown below. At the base of the pyramid are our ultimate means, low entropy matter-energy–that which we require to satisfy our purposes–which we cannot make, but only use up. We use these ultimate means, guided by technology, to produce intermediate means (artifacts, commodities, services, etc that directly satisfy our needs. These intermediate means are allocated by political economy to serve our intermediate ends (health, comfort, education, etc. ), which are ranked ethically in a hierarchy by how strongly they contribute to our best perception of the Ultimate End. We can see the Ultimate End only dimly and vaguely, but in order to ethically rank our intermediate ends we must compare them to some ultimate criterion. We cannot avoid philosophical and theological inquiry into the Ultimate End just because it is difficult. To prioritize logically requires that something must go in first place. The ends-means pyramid or spectrum relates the basic physical precondition for usefulness (low entropy matter-energy) through technology, political economy, and ethics, to the service of the Ultimate End, dimly perceived but logically necessary. The goal is to unite the material of this world with our best vision of the good. Neoclassical economics, in neglecting the Ultimate End and ethics, has been too materialistic; in also neglecting ultimate means and technology, it has not been materialistic enough. The middle position of economics is significant. Economics in its modern form deals with the allocation of given means to satisfy given ends. It takes the technological problem of converting ultimate means into intermediate means as solved. Likewise it takes the ethical problem of ranking intermediate ends with reference to a vision of the Ultimate End as also solved. So all economics has to do is efficiently allocate given means among a given hierarchy of ends. That is important, but not the whole problem. Scarcity dictates that not all intermediate ends can be attained, so a ranking is necessary for efficiency–to avoid wasting resources by satisfying lower ranked ends while leaving the higher ranked unsatisfied. 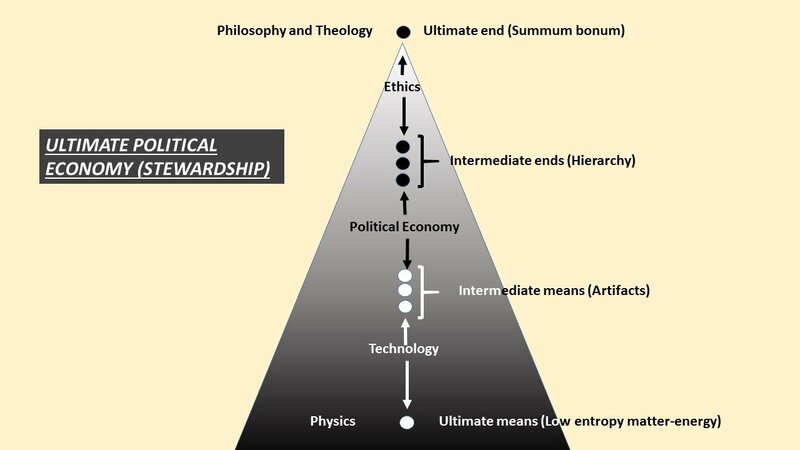 Ultimate political economy (stewardship) is the total problem of using ultimate means to best serve the Ultimate End, no longer taking technology and ethics as given, but as steps in the total problem to be solved. The total problem is too big to be tackled without breaking it down into its pieces. But without a vision of the total problem, the pieces do not add up or fit together.